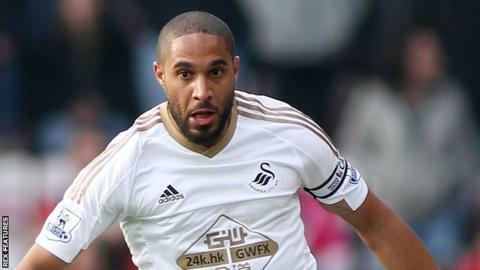 Captain Ashley Williams says he has not enjoyed this season, despite Swansea City seemingly winning their battle to avoid Premier League relegation. Saturday's vital 1-0 win over Aston Villa means Swansea are now 10-points clear of the bottom three with just seven games remaining. However, Williams says he will be pleased when the campaign ends. "This season has been a grind and the Villa game summed it up. It has not been enjoyable, to be honest," he said. Williams admits the season has been unsettling, with Swansea sacking manager Garry Monk and appointing Francesco Guidolin, who has since suffered health problems. "There has been a lot of changes, with the manager for example, so it is not ideal," Williams reflected. "It is the kind of season you want to get out the way. "Get safe, see where you finish and try and put everything right before next season. "We will have a review at the end of the season and this one is an important one. "For whatever reason, we've got it wrong this season. "It is unacceptable for a club like Swansea to have a season like this, I believe." Williams feels Swansea can get back to their best next term and ensure they get back to a more comfortable position, having finished ninth, 12th and eighth in their three previous Premier League campaigns. "With the players we've got, at such a good club, we need to do better next season so there is a lot of talking to be done in the summer," he said. "The pleasing thing is we've got through it. "There are many reasons why (Swansea have underperformed) and we will all have to do a lot of reflecting, looking at ourselves. "There has been a lot going on. "The pressure is off us now a little bit. We shouldn't be content to be done with 36 points. "We need to finish as strongly as we can and then it all looks a little bit better."